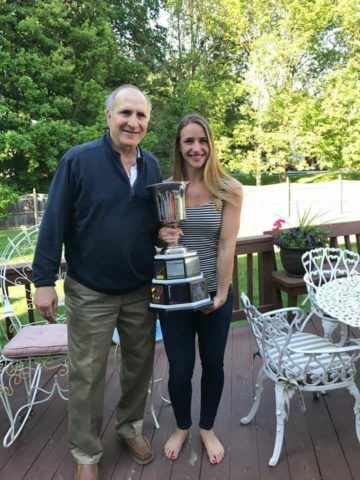 Once her collegiate career ended at Brown University Sam Donovan wanted to keep playing hockey. 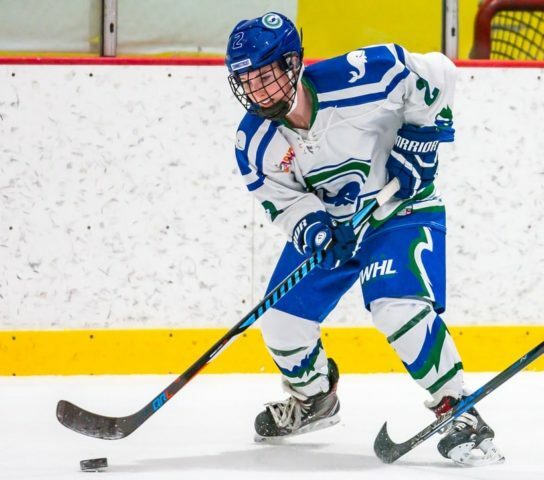 Lucky for her she was drafted this past summer in the 2017 NWHL Draft and with her eligibility finished she was free to sign with the team that drafted her, the Connecticut Whale, which she did on February 27. Donovan led her team as a senior in points (21), goals (9), and assists (12), and she also netted her second career hat trick on October 22. In two regular-season games, Donovan has already notched her first NWHL point and is looking to make an impact as Connecticut heads into postseason play as the biggest underdog in the league. She could be the Whale’s secret weapon in the playoffs, who knows? 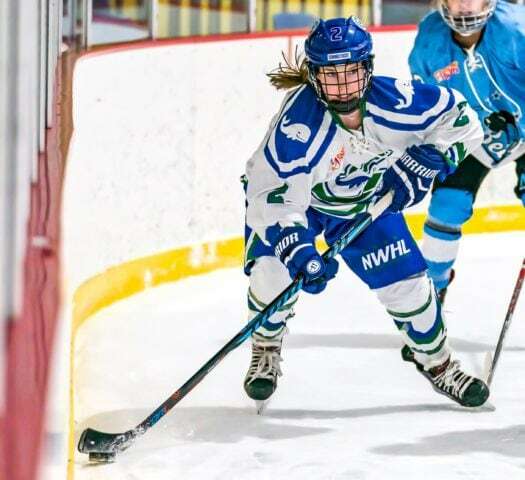 The Hockey Writers caught up with the 22-year-old speedy forward from New Brighton, Minnesota following her first home game as a pro to find out about how she’s adjusted so far. (Disclaimer: Sam was smiling the entire six minutes we spoke, and is genuinely excited to be a part of the NWHL). The Hockey Writers: How do you feel after your second NWHL game that you have adjusted to the pace and speed at this level? Sam Donovan: It’s definitely faster and more physical, but my teammates have been super supportive and I’m just trying to keep up. THW: Is that another adjustment you’ve had to make, picking your battles along the walls and in the corners? SD: Yeah definitely, and also getting rid of the puck faster to my teammates. Everyone knows where they are going to go with the puck before they get it, that’s something that’s totally different (at this level). THW: You were drafted by Connecticut (2017 NWHL Draft, 2nd round/5th overall), did you follow the team a bit while you were playing your senior season? SD: I was very interested, the games are on Twitter and online so I was trying to follow as best as I could. THW: For those that haven’t seen you play collegiately, how would you describe your game? SD: My college season, we haven’t made it to the playoffs in any of the four years that I was there, we didn’t really have the best records. The biggest difference here is the positivity – if we’re down everyone is just so positive and all about ‘we’re going to get the next goal’. It’s so much fun playing with this group. Losing is never really fun but you just have to focus on your own game and try to bring positivity to yourself and your teammates the best you can, That’s all you really can do. THW: Going forward, is this league something you’d like to be a part of next season? SD: Oh yeah definitely! Everyone here has been so welcoming and so great, I love this team so much already – and it’s only been two games! I would definitely love the opportunity (to come back). THW: Before that first game last week how many practices did you have? THW: How challenging is that? I mean, you probably just met them before the game and said, ‘Hello, my name is…’ Some of your teammates don’t even have nameplates at the moment! SD: Yeah (grins), I’m still trying to learn everyone’s name, to be honest, but I’ll get there eventually. I got there for the first game and the coaches went over the system very briefly. They pretty much said: skate hard, shoot the puck, and do what you do. THW: Did you play with the same linemates last weekend and this weekend? SD: Last game I played with Kaycie Anderson (laughs), I’m still learning names! Tonight I was with Kelly Babstock. Kaycie is from Minnesota, but I didn’t know her there. But we have that in common. THW: How did you find your way from Minnesota to Brown University in Providence, Rhode Island? SD: I looked at a couple of different places out east, but I really just felt at home at Brown. I liked it there. THW: All you have to do is win two single-elimination games and you’re Isobel Cup champions. That has to be an exciting feeling, and I can see you are smiling already. SD: I know! I’m so excited. Anything can really happen and our coach was saying that in the locker room that this is to our advantage. People might take us lightly, I don’t really know. But anything can happen in a one-game knockout. It’ll be fun, I never played in a playoff game. We just have to work hard and stay positive. 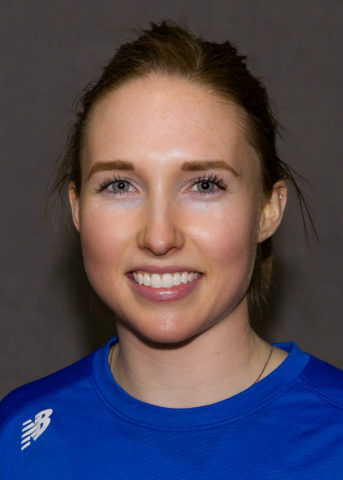 THW: Last season Hayley Scamurra was in the same situation with Buffalo that you are now in and she was a beast as well as a key contributor. That’s something that could be an advantage for you – other teams not knowing you well, right? THW: You got an assist, and should have/could have had a goal, that has to give you some confidence going forward, right? SD: I’ve been just so happy to be here this whole time. This has been so much fun, I haven’t had any down moments!